Brief Synopsis – After his preacher father discovers that he is gay, a young man is sent to a “camp” to convert him from being gay. My Take on it – This is a movie that I heard a lot of buzz about a few months back especially since it was the first collaboration between Nicole Kidman and Russell Crowe. This film does a wonderful job depicting the way that certain groups try to forcibly change the feelings of people who think differently than they want them to. 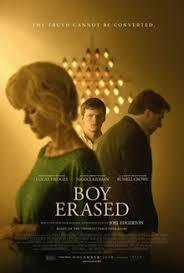 Both Crowe and Kidman do fine jobs with their roles, but they are completely overshadowed by Lucas Hedges who is superb in this film. Despite his young age, he has proven again and again how powerful an actor he can be especially on difficult roles like this one. We are able to feel the emotions of his character as he constantly struggles to find the right path in life for him despite the fact that everyone else around him are trying to sway him in the opposite direction. This film has a great message and shows it very powerfully. Unfortunately, some of the scenes in the film diminish the effectiveness of that message and instead of being a great film, they only are able to make it a very good film which leaves you wanting it to be more. Bottom Line – Very interesting film that shows how certain groups try to enforce change on people who are different from what they believe they should be. Crowe and Kidman are both fine as the parents, but Hedges once again shows how powerful an actor he is with this role. WE can truly feel the emotions of this kid as he struggles to find his way in life despite the forces around him trying to sway him in the opposite direction. The message of this film is quite powerful but certain scenes diminish the effectiveness of it all and instead of being a great film, its only manages to be a very good one instead. Recommended!